The reality star wore a maang tikka to a church service with a white gown and Tweeples didn't find it cool. Last week Kim Kardashian posted a picture of her attending a Sunday church service. In the post she shared on Instagram and Facebook, the reality star is seen wearing a white dress which she's paired with a maang tikka. On a regular day, one would have written off the picture as a model's fashion statement. However, Indians on Twitter and Instagram did not take it lightly and called out the actor for appropriating Indian culture. "For those of you who don’t know, the maang tikka is a ceremonial head piece traditionally worn by the bride. Wearing white in India is traditionally reserved for funerals. On top of that she wore this to a Christain service. 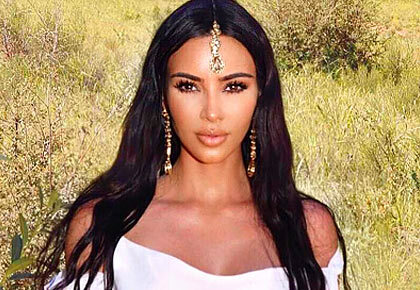 If she wore the maang tikka to a traditional Indian event I’d KINDA get it like oh she tried... but idk (i don't know)," a user wrote in a comment on Kim's picture. In 2018, Kim (a white woman) was accused of appropriating African culture when she sported cornrows to an MTV event. 'For the thousandth time, what we're mad at is that when Kim (or any white woman, for that matter) wears styles such as these…they get praised all the way around for it. But when black women do it…we get told that it's unprofessional, or that we look unkept. Or that we're a distraction. Not to mention that fact that they don't even consider giving credit where credit is due...It's honestly a triple slap in the face. That's what we're mad about nothing more, nothing less,' a user named Introvert At War wrote on Twitter. Also, this isn't the first time Kim has upset Indians for appropriating culture. In April 2018, when she covered Vogue India's anniversary edition, Twitterati trolled her for wearing sarees and lehengas for the photoshoot. Some users had criticised the magazine for putting an international model on its cover as opposed to an Indian one. Another user called out the reality star stating how Kim had previously mentioned that she'd found Indian food to be 'disgusting' but chooses to wear Indian clothes and accessories for publicity. Dear readers, what do you think about Kim Kardashian wearing a maang tikka with a white gown? Do you think it makes an interesting style statement? Or do you feel it was wrong of the model to appropriate Indian culture by wearing a bridal accessory to a church service? Take the poll given below and let us know what you think.